When your feet, ankles and calves are crying out for mercy at the end of a hard day, pamper them back to life with this Prospera deep water massager. 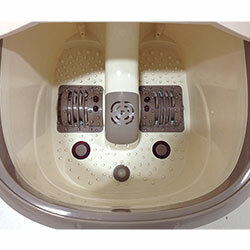 These foot spas have an open box and are SOLD AS IS. No returns accepted. They have mechanical and cosmetic issues preventing standard operation. It does not function to its original standards and may need additional servicing and parts. They have components that do not work. With a little know-how and some elbow grease, this Bargain Bin spa could be a steal! 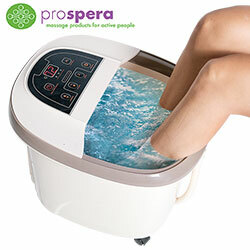 It combines the tension and pain-busting power of 2 Shiatsu foot massagers plus 2 surfing jets that re-energize tired, aching feet and leg muscles. Also features 3 built-in massage programs for custom performance, adjustable heat from 95-120 degrees, 60-minute timer with 10 minute intervals, easy-to-use electronic design, ergonomic design for your legs and feet and more.